This hotel is one of the most charming luxury hotels in downtown Lisbon. Its location could not be better: right at the Praça Luis Camões. Just like Hotel Chiado, the real price for me is the top-floor terrace. Comfortable sofas and chairs, heating and a great view. Come at night, and have a drink here before dinner. The terrace is heated, so it’s comfortable all year round. Expect to see a lot of (well-off) foreigners and no Portuguese at all. Prices are as expected: expensive. Best to just take a deep sigh and enjoy the view. Or have some of the free Japanese snacks, they are awful but free! The terrace does not seat too many people, so try to visit during off-hours. 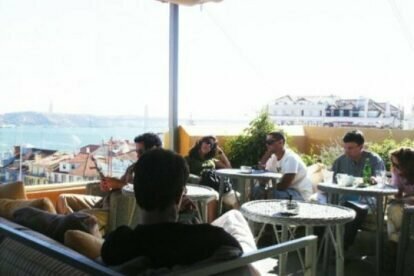 A great combo is to have a drink at the terrace and then head for dinner downstairs at Restaurante Flores do Bairro, which is part of the hotel.